I believe I have mentioned before my love for all kinds of Italian pastries, ever since I was a little girl. They not only look pretty, but I can't think of one Italian dessert that I don't like. So I consider myself pretty blessed to have married into an Italian family; not only because they are so warm and loving, but they are the most amazing cooks and my husband and I and are always fed extremely well. Every couple of years we have had zeppole day with my husband, Rene's family. It's amazing; we get together, make a whole bunch of zeppole, both the savoury and sweet kind, and stand around and eat. This recipe is a little different to the recipe used on those occasions, and that's mainly due to there not really being a recipe! It's mostly just guess with your hands and eyes until it feels right - the typical Italian way! 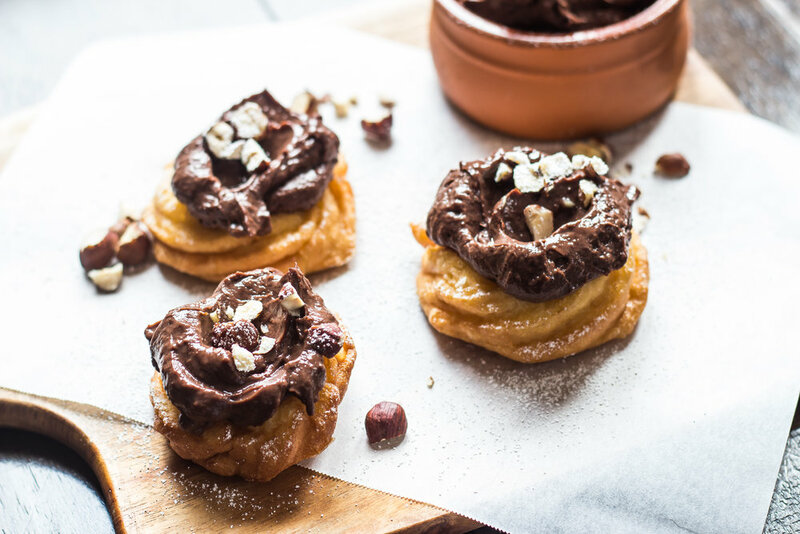 I came across this recipe on one of my favourite websites, Gourmet Traveller, for Zeppole di San Giuseppe; however, I adapted it by using a decadent chocolate pastry cream recipe from the new cookbook by Bourke Street Bakery: All Things Sweet. The zeppole dough is a little different to many recipes out there, as this one is based on a choux pastry process and uses no yeast. When deep frying the pastry, make sure the oil is no cooler than 180˚C, or too hot, to ensure the pastry cooks evenly throughout. 1. To make the chocolate pastry cream, first of all place the egg yolks, sugar, plain flour, cornflour and cocoa powder in a bowl and whisk together until well combined. 2. In a saucepan, bring milk to the boil. Remove from heat and slowly pour milk over the chocolate mixture while whisking to combine. Return the mixture to the saucepan and cook, while whisking, until thickened (approximately 1-2 minutes). 3. Pour custard into a glass dish and cover surface with plastic wrap to prevent skin from forming. Refrigerate for 2-3 hours minimum. 4. Meanwhile, to make the zeppole dough, bring butter, sugar, flour and 250ml water to the simmer. Gradually add the flour and stir to combine, over medium heat, until mixture forms a ball and pulls away from the sides of the pan. Transfer batter to a mixer fitted with a paddle attachment and beat on low speed, whilst adding eggs one at a time and beating well after each addition. Scoop mixture into a piping bag fitted with a 1.5cm star nozzle. Set aside to rest for 20 minutes. 5. Heat oil in a saucepan or deep fryer until temperature reaches 180˚C. Cut individual squares of baking paper (approximately 8cm x 8cm) and pipe dough into 5-6cm rings on each individual square. working with one square at a time, carefully lower into oil, and deep-fry until rings loosen from paper (about 1-2 minutes). Drain on absorbent paper and cool to room temperature. 6. 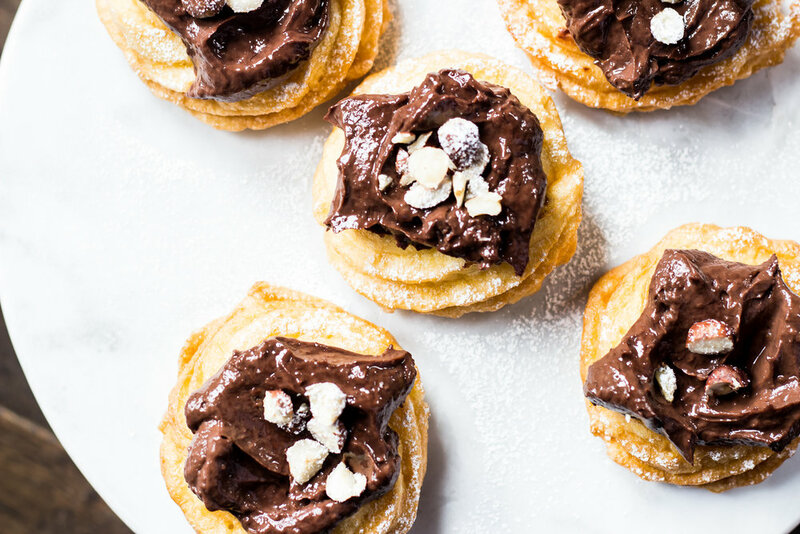 Top each zeppole with a spoonful of chocolate pastry cream and sprinkle with some chopped hazelnuts. Dust with icing sugar to serve.